I really should have called this "Giveaway Week"... but more on that later. Have you started on your holiday greeting cards? Thanks to Tiny Prints, I've got this task off my To Do list. I really loved loved loved the cards I got from Tiny Prints last year so I was excited to buy from them once again. Not only does Tiny Prints have unique and memorable card designs, but the card stock they use feels great in your hands, and they ship to Canada! Awesome. Using the Tiny Prints site is so easy too. I really like the "My Picks" feature which allows you to save designs you like as you browse. I like to browse though all the designs, pick out a few favourites, do some mock ups so I can see what the finished product will look like, and buy the one I like best. Tiny Prints makes that whole process fast and easy. Most of the card elements are customizable; you can easily change the text, font, font size, colours, and layouts. Here's a few of the designs I considered using. I love the round ones you can hang as an ornament! And here's the card from last year. Wow, what a difference a year makes, eh? Now onto the giveaway... Tiny Prints has kindly offered a $50 gift certificate to one of my readers to print their holiday cards this year! And Canadian readers, there is plenty of time to get your cards shipped to you (I ordered mine on Nov.24 and according to Fedex, they should arrive on my doorstep today!). 2. Receive one entry for becoming a follower & leaving a separate comment to let me know you've done so. If you're already a follower, leave a comment to let me know. And don't forget, leave me your email address or blog address in your comment so I can contact you if you win! You have until 10PM EST December 3, 2010 to enter. The winner will be randomly drawn from all entries and announced on December 4th. Good luck! I love Tiny Prints! Made our birth announcements with them a few months ago and they came out great. Oh! And I follow you :) Adding you to my Twitter now, too! I have you on my list of favourite blogs...not sure if that counts. But either way, had to leave a comment about the insane amount of cuteness!! Hehe. wow! 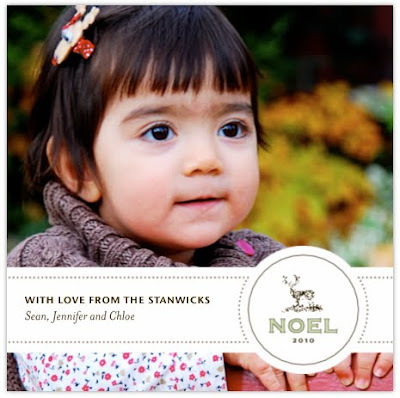 this is exactly what i've been looking for as an alternative to boring christmas cards! and i have been following your blog for a while now via google reader. love it! Your card from last year is deliciously cute! I love your blog and gladly follow! The cards you picked are adorable. Which one is the winner or did you order more than one style. Good choice putting her in the chunky sweater. I like the cared from last year the best even though all are completely adorable! Those are so amazing. She is such a cutie! Love Tiny Prints! And your cards from last year are just adorable.. love the little outfit on her! I really love these cards and would LOVE to win! Those cards look great! I love all the different things you can do! Oh my goodness Chloe is adorable! Love the cards too. Thanks for the chance to win! I adore Tiny Prints - we've used them for everything the past few years. Thanks for a chance to win! Your cards are absolutely adorable! I have been a bad girl and delayed buying my Christmas cards, so these would be perfect!!! We order Tiny Prints cards every Christmas, and this year, I'm so excited to have maternity pictures on there!! The cards are so lovely! Thanks for the chance to try them out! So cute! What a fun way to send a card. Love last years card! Can't wait to see this years! I follow you :) This is a great giveaway Jen!! I love Tiny Prints designs. Oh my goodness, I would LOVE these cards!!!! I follow your blog, and I also follow you on Twitter!! Tweeting about you now!!!! tiny prints has some great stuff! i love the ones that you posted--darling! of course I am a follower! Oh, and I just confirmed- I follow your blog! oh I love Tiny Prints! I've never heard of Tiny prints. I'll have to have a look around the website. My email address is galadrielrosalie at hotmail dot com. And I'll definitely join you in the Tiny Prints love. I've already picked a few templates that I love for my soon-to-be-born son's birth announcements. And I love that they'll pre-send me the enveloppes so that I can address them right now while I still have some free time on my hands! Everything that they sell just looks great! oh, and I am already a follower of your dear blog! Love Tiny Prints - I just directed my Mom there to design her new business cards! Love Tiny Prints! We just ordered our birth announcements from them. I LOVE Tiny Prints! I ordered my daughter's adoption announcements through Tiny Prints! Thanks for the chance to win! Love this!!! Super giveaway and very timely- I'm sooo behind on the Christmas cards. I'm a follower- I thought I was already but somehow missed it- anyhoo..definitely following your wonderful blog!!! Would love to win - always nice to learn about a u.s. company that ships to Canada. Thanks for the tip! How adorable is Chloe and those cards! Would love to win! Thanks - we haven't made our cards yet. These are so adorable!! I LOVE her little outfit from last year. I would LOVE to win this giveaway! I was just looking at their website for my cards for this year. Love Tiny Prints. I've been on the wen site so often, but can't decide!! I already follow your blog because it is so wonderful. Love Tiny Prints and love the card designs you have picked out! so cute! love tiny prints! I have never seen the round ornament-esque ones before, but they are such a great concept! I love them! Could be used as gift tags too. I'm having a giveaway too - stop by and check it out! Love the cards! Last years outfit is too cute!! Hope you are well. So cute! Your daughter is adorable! so cute! A perfect way to say Happy Holidays. This is my first time to your blog and I've enjoyed reading your posts! 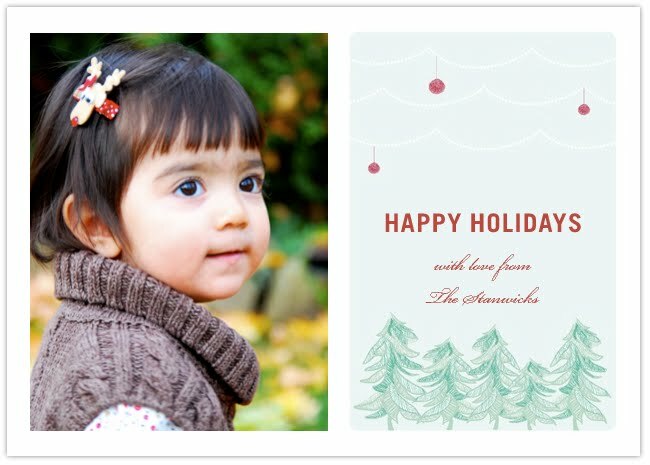 The Tiny Prints cards are adorable with your daughter's picture on it--I have a 1 year old granddaughter whose picture I would love to print on my Christmas cards this year. 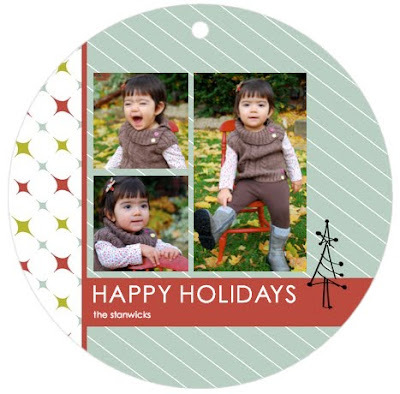 I love tiney prints and haven't yet started my holiday cards so this is a great giveaway! Love your card designs! Can't wait to see what you ended up going with. Thanks for the giveaway! Great cards - she is precious! I love Tiny Prints....they always have some great designs. I would love to make Christmas cards this year!